Due to popular demand, Exit now offers a life time subscription to the PPeH at USD$550. The subscription is based on an initial subscription of USD85 followed by 11 renewals (total 22 years of updates). The Peaceful Pill eHandbook is updated up to six times per year, bringing subscribers the best available information on end of life choice strategies. Please note, Exit reserves the right to determine the time and manner of updates and offers no guarantee of a minimum number of updates in any subscription period. A life subscription includes access to the Peaceful Pill forums (on approval). 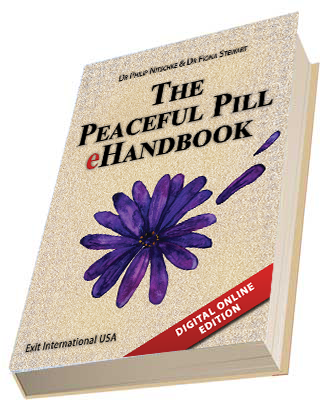 The Peaceful Pill eHandbook is concerned only with strategies that are reliable and peaceful. The Peaceful Pill eHandbook is published for people aged 50 years and over (or who are seriously ill or who have other valid reasons for wanting this sensitive information) and their friends and family. Photo ID will be required if we are unable to ID you online. The Peaceful Pill eHandbook ranks the most important, effective & peaceful end-of-life strategies according to Exit’s unique Reliability-Peacefulness Test. The live ONLINE format allows the book to be regularly updated, ensuring the most up-to-date information possible. Subscription period is 24 months after which the eHandbook can be renewed at 50% discount. Upon purchase, your email address will be used as your log-in username. The online edition is sold only to folk who are over 50 years of age, of sound mind or who are seriously ill.
Photo ID may be requested before a subscription is created. Note – the eHandbook is not available for reading on Kindle unless using Kindle’s Silk Browser.